Capcom's long standing hero Arthur at long last receives a proper resurrection in the form of Ultimate Ghosts 'N Goblins for the PSP. Taking the traditional 2D sprite-based platforming classic forward, the newest installment includes a more diverse array of weapons, cooler enemies and some ingenious level designs that make for a challenging, satisfying experience. The game's visuals remain true to the original game, though with added sophistication and 3D effects that take the series right up to the present. The game's blending of traditional play mechanics with RPG elements makes for an intense challenge. UG'NG is a fantastically polished title that lives up to the legacy of its ancestors and makes this update one that most classic gamers should adore. One of the most beloved and cherished gaming series of all time is Capcom's classic Ghouls 'N Ghosts, and with several ill-fated attempts to bring the series into 3D with the lame Maximo series, they have finally gotten it right by returning the series to its roots. Taking a traditional 2D platform approach, the new game stays true to the mechanics and overall feel of the original games, with all of their charm, challenge and classic gameplay intact. Those familiar with the previous games will immediately recognize the story's hero Arthur, who once again returns to battle the denizens of the night, who have captured his princess. Ultimate's first level serves as a beautiful tribute to the first levels in the previous games, with the classic music and structure very much in evidence. However, you'll encounter some new enemies, such as phantoms and ghostly hands that try to grab Arthur as he traverses the level. Once you've completed the first level, things become interesting, as Capcom twists and turns the familiar level design and structure in unexpected and innovative ways. The first thing you'll notice is that the game isn't as linear as it once was. Instead of going strictly left to right, you'll also have to go up and down, and there are many areas where you will also move right to left. This adds variety to the gameplay, making things more challenging. The levels themselves present multiple challenges and different enemy types, which require more skill and thought to defeat. It's boss encounters can be positively epic, with smarter more intense battles that will take a lot more skill and ingenuity to defeat. The game's overall pacing mirrors the originals, but there definitely seems to be more going on at the same time, which requires a great deal of skill and concentration. This evolution is very much in keeping with the GnG legacy, where players needed persistence and skill to progress. There's little doubt that the game's difficulty is much higher than most other retro titles, which usually feel a bit watered down. Capcom has actually made the newest GnG harder than the original games, which means it will take quite some time to defeat. While this high level of difficulty might turn off some players used to the passive button mashing that passes for many retro titles. Ultimate Ghouls 'N Ghosts is definitely of the classic mold and offers something that's sorely lacking in most games these days. From a control standpoint, one of the best aspects of the game is that it also retains the feel of the classic GNG titles. While the movements might seem a bit clunky these days, players can quickly become acclimated to the game's quirks. It seems counter-intuitive, but using the analog controller is actually the superior method, since the PSP's standard D-pad doesn't offer quite the responsiveness or fluidity the game requires. Once you've gotten your bearings, you'll find a mixture of the familiar and new in the game. Arthur himself moves and controls much as he did in the original game, with the same quirky appeal that he had originally. As in the original titles, players can collect other weapons as they run over them in the levels, but there are now many more types of them. In addition, there's a new power-up system that adds more strategy to the gameplay, making Ultimate feel a lot deeper and more challenging to the veteran gamers out there. Most of the game flows nicely, though there are a few areas where you might become frustrated. Luckily, most players should get through these difficult areas with practice and persistence. There are some points that can feel cheap at first, and you'll probably miss the mark repeatedly. Once you've mastered the sometimes complicated jumping and shooting techniques the game requires, you should have the added skills to sail right through the next time you encounter similar areas. Like the original game, Arthur's armor falls apart as he's hit by enemy fire or comes in contact with his foes, until he's left only with his boxer shorts. Unlike the original game, however, there are some concessions made to make the gameplay flow a bit better. Instead of automatically returning to the start of the level, he'll respawn at the same point, making things a bit easier than the older games. Adding to the challenge this time around is the sheer number of enemies and their persistence, which makes them much harder to destroy. There are many areas of the game that would have been rendered impossibly frustrating otherwise, but this small change makes all the difference. In addition to the standard arcade style mechanics players have come to grow and love, Ultimate adds some RPG style elements, where you can manage and use items such as weapons, power-ups and potions on an items screen. It's fairly simple to navigate, but adds just enough substance to the game to make it more enjoyable, without interfering with the basic arcade appeal too heavily. There are three levels of difficulty included in the game, and even the novice setting can be quite challenging, it's the Ultimate and Normal levels that might cause some problems. The game definitely lives up to its billing as one of the toughest games to come out recently. However, you have a real sense of accomplishment when it come to this, and besides what in life is truly worthwhile that you don't have to work for? Gamers who find themselves continually disappointed by games that can be defeated in a single session should take heart by this release, it will definitely require a time and skill investment to defeat it, so you'll definitely get your money's worth if you're looking for a challenge. All of these changes make for a more robust experience that expands the original formula without losing the essence of its appeal. 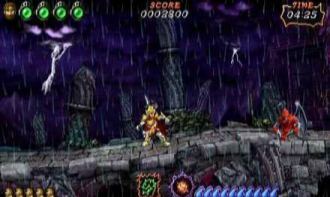 The same can be said for the game's visuals, which retain much of the original charm while adding new elements. The 2D backdrops have been enhanced with more detail and quasi 3D effects, though still retain the hand-drawn look that was the essence of the series appeal. This approach successfully brings the action brilliantly to life on the screen in ways the original 8-bit NES and 16-bit Genesis/SNES installments never could. It's taken more than a decade, but this feels like a fuller realization of the feel of those previous games. Implementing a solid presentation is key in these modern updates, and the character animations and designs are absolutely stunning to behold. Ultimate G'NG's animation is fluid and vibrant throughout, with great character designs, such as the squiggly arms that grab at Arthur, ghostly clouds which twist and turn as he walks across them, apparitions that glow in the darkness and screen filling, impressive bosses that can cause quite a fright. In addition to the classic musical score, there are a number of new tracks that play in the background and these fit the mood and action of GNG perfectly. Ultimate Ghouls 'N Ghosts' slick presentation is stunning and a high compliment to Cacpom's approach when it comes to updating their classic series - it retains the classic aesthetics and builds on them intelligently - a pattern that has been repeated successfully in many of their recent PSP re-imaginings over the past year. Ultimate Ghouls 'N Ghosts follows this formula astidiously, and succeeds in ways that will please anyone who grew up with these classic games. The challenging, yet satisfying gameplay has been updated just enough to make things feel fresh, but there's enough nostalgia, classic gameplay and challenge to make this, at long last, a truly satisfying sequel to those classic games that deserves the name and pedigree.